If it's good for the environment and it's good for business, then it's good for us and our partners. 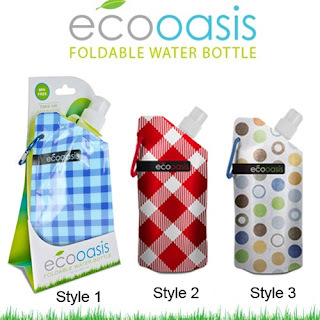 Fashionable 16 oz BPA Free foldable water bottle with matching carabiner (D ring) making it the perfect bottle for anyone on the go. My girls love to drink water out of fun and stylishs water bottles. the eco oasis pouch is super cute and stylish. i love that it can flatten out when not in use and easily fits in my diaper bag and takes up almost no room at all. My girls love using the eco water pouch. thank you so much for such an awesome product. head over and check out all the awesome products at smart planet. Bento's aren't just for kids folks. Momma's gotta eat too, and today, Momma's eating in style! One of the reasons I started making cute bento's for the kids was because I wanted them to have a good selection of visually appealing, healthy, and fun foods to pick from in an effort to have empty lunch boxes returned to me at the end of the day. Well, this philosophy can very well be applied to myself too. Human's are visual creatures, and we're far more likely to be attracted to food that is presented in an appealing manner. Enter cute girly lunch box! In an effort to get healthier, I've been running 2-3 days a week with a group of people from work. While this is excellent exercise, after my run I am famished! Like want to eat everything and anything in my path famished! So, to combat my extreme hunger I've been packing a protein rich salad on run days. Today's lunch is packed in my super cute hot pink Smart Planet Collapsible Lunch box which I love because it holds a TON and collapses flat for transporting home at the end of the day. Today's lunch consists of a mixed green salad with cucumber and carrots, topped with cranberry goat cheese and balsamic raspberry vinaigrette, snap peas, and a tuna baked avacado... Mmmmmmm! Also enjoying a raspberry Chobani and Numi tea! Looking for some more grown up eats inspiration? Check out the link-up below! Ever since I received my free tumbler from a k-cup promotion I have been completely obsessed with reusable cups with lids and straws! Other than being slightly eco-obssessed, I am a klutz if you have ever seen a klutz! Dropping and spilling things is my specialty, but sporting a sippy cup when you are my age and childless would be kind of strange, don’t you think?? These cups are a perfect solution for that! You can literally tip the cup over and it does not spill (quickly or immediately) unless it comes out the straw. The straw has a ring around it so it won’t fall out of the lid too! It’s dishwasher safe and BPA free. I love this cup and so does everyone else in my family! Enter for your chance to win one using the rafflecopter below. US residents only, ages 18+. See rafflecopter for full rules and disclosures.